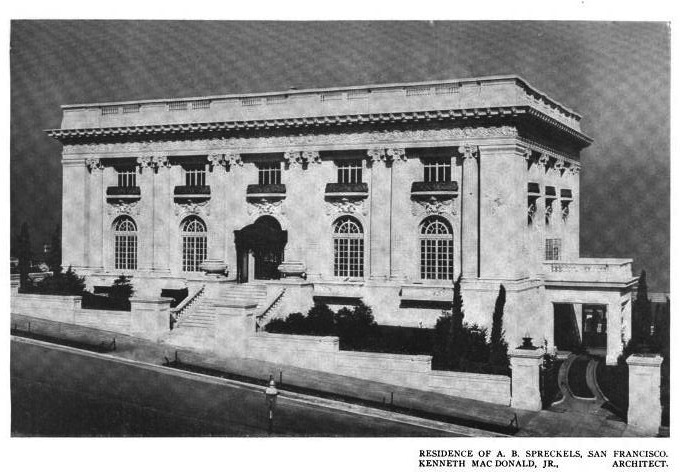 The Adolph Bernard Spreckels residence designed by Kenneth MacDonald Jr. c. 1912 in San Francisco, California. 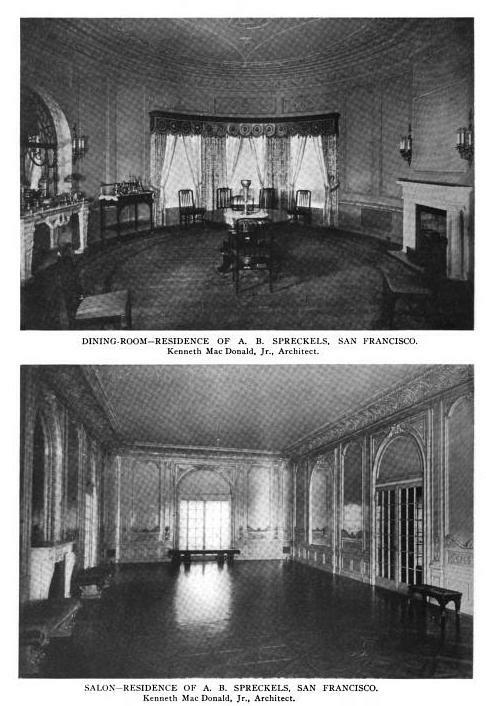 Spreckels was the head of Spreckels Sugar Company and donated the Palace of the Legion of Honor Art Museum to the city of San Francisco in 1924. His wife Alma de Bretteville Spreckels was a noted philanthropist and had the nicknames 'The Great Grandmother of San Francisco' and 'Big Alma'. Click HERE for more on the Spreckels residence and HERE to see it on google street view. I pass by this house all the time and it looks about the same. 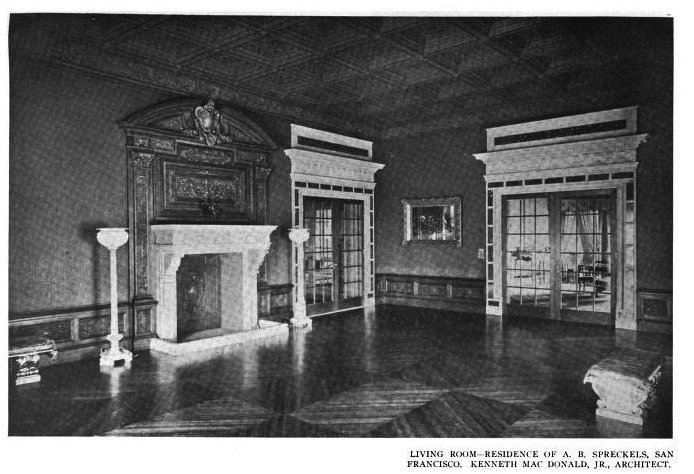 Around 1937 Alma remodeled the house into three apartments, planning to keep her children close by. Only her son, Adolph Jr., lived there at first. Alma moved into the parlor floor and the top floor was rented to Mr. and Mrs. William Roth, owners of Filoli (and Matson Shipping, and the Royal Hawaiian Hotel, and Honolulu Oil, etc., etc.) 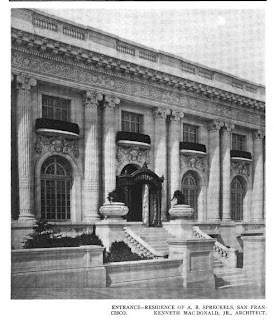 The Bryaton Wilburs (Wilbur-Ellis) were also sometime tenants. Daughter Dorothy Munn had an apartment there into the 1980's, (post Paris and before she moved to Palm Beach.) 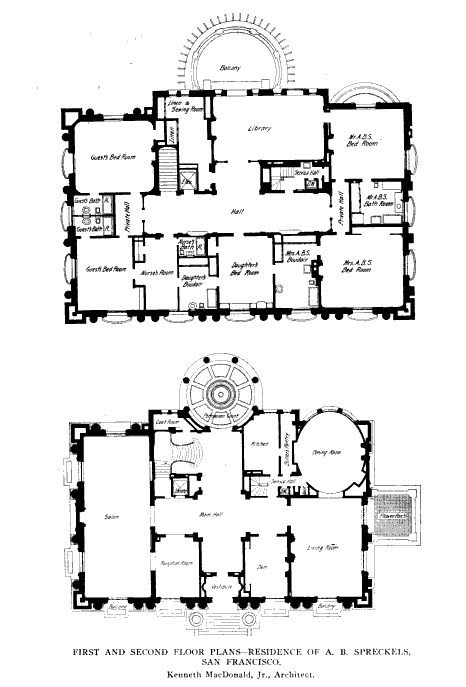 Grandson John Rosekrans and his wife Dodie also lived in one of the apartments for awhile. 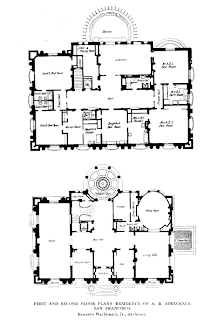 The house was sold in about 1990 to Danielle Steel and it was converted back to a single family house. My dear friend is the granddaughter of BIG ALMA...the last of the very REAL CALIFORNIA legends! Her Granny stands atop the column in Union Square overlooking the City she once reigned supreme as the Dewey Memorial! She loved Swans Oyster bar deliveries in the afternoon with her Martini's...who could beat that! Dali spent quite sometime living there while painting Dorothy's image which now hangs in the Legion of Honor - sadly they have removed Alma's portrait from the entrance of the museum - perhaps one day this wrong will be right again. Danielle Steele had the most beautiful wedding there for her daughter recently featured in Vogue. THE MOST beautiful home in San Francisco aside from Dodie Rosekrans and Ann Gettys which still are not sitting on half a City block.